He Was Caught Trying To Join ISIS, Now He's In Jihadi Rehab : Parallels A Somali-American, who pleaded guilty to attempting to join the Islamic State, has been approved for America's first jihadi rehab program. His counselor explains the de-radicalization process. 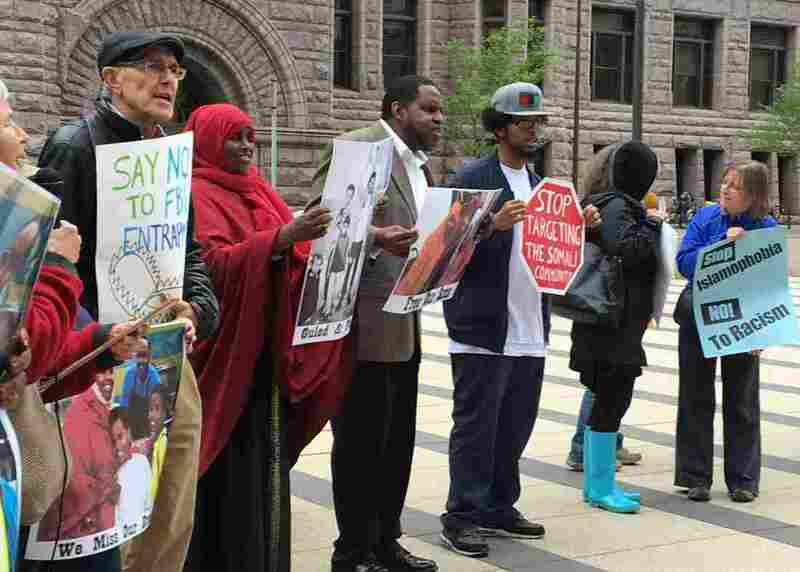 Protesters gathered outside the federal courthouse in Minneapolis where three young Somali-Americans are on trial for allegedly planning to go to Syria to join the Islamic State. The demonstrators say the FBI and local law enforcement is targeting and entrapping Somali-Americans in terrorism cases. Six men have already pleaded guilty. All eyes were on 20-year-old Abdullahi Yusuf when he stepped on the stand in federal court last week in Minneapolis to testify for the prosecution in America's largest ISIS recruitment trial. As Yusuf began to speak, his words provided a rare, behind-the-scenes look at how more than a dozen young men convinced themselves that the way to prove they were good Muslims was to travel to Syria and fight for ISIS. The radicalization process in this case was frightening simple. It began with a meal at a Somali restaurant and a pickup game of basketball. Then, he testified, smart phones came out of their pockets and the young men began watching ISIS videos on a YouTube channel called "Enter the Truth." They stayed up until 2 a.m., Yusuf said, talking about the killing in Syria and watching ISIS videos. "The channel is saying that the West is corrupt and you can follow religion perfectly over there [in Syria]," Yusuf told the court. "And you don't have to conform to anyone else's traditions." Yusuf said he had never seen videos like that before and when he got home that night, he stayed up for another couple of hours watching the videos on his own. In retrospect, Yusuf said that it was that Friday night in 2014 that his ISIS recruitment began. He testified he was introduced to radical Islam by the three men now on trial, Guled Omar, 22, Abdirahman Daud, 22, and Mohamed Farah, 21. "My former friends," he called them. Asked why he was testifying against them, Yusuf stopped for a moment and said, "Because I realize what I did was wrong ... and I am thinking for myself for once." Yusuf is not only a key witness in this case. He's also the charter member of America's first jihadi rehabilitation program. He was arrested last year, months after the FBI stopped him from boarding a flight that would eventually have taken him to ISIS in Syria. He pleaded guilty in February to providing material support – essentially himself, as a fighter – to a terrorist organization. While he awaits sentencing, he is getting counseling so he can better understand what lead him to embrace ISIS. His counselor is a local high school social studies teacher named Ahmed Amin. Amin was born in Somalia and his family moved to the U.S. when he was 12. His English is unaccented. He wears designer shirts. He the kind of teacher with the creative lesson plans who holds classes outside on sunny days. He teaches at Roosevelt High School during the day and began working with a Minneapolis group called Heartland Democracy that has created a counseling program for young men like Yusuf. "I understand the difficulties of identity that lead people to join organizations like ISIS," Amin told NPR in an interview. "It is hard trying to live in two worlds. From 9 to 5 these kids have to live one way when they are at school, they are socialized to be American. And then they go home, learn to be religious and are trying to cope with that. It is harder than you'd think." Abdullahi Yusuf was just 18 years old when he decided he would go to Syria to fight with ISIS. Amin is trying to help him understand why he made that choice. "Initially, I wanted him to read some texts that would get him to really question his own personal views, to question his understanding of the world," said Amin. "One of the first things I had him read was Sherman Alexie's Reservation Blues." The 1995 novel is about the difficulties of navigating two worlds at once, in this case, the life of an American Indian off the reservation. Amin also had Yusuf writing papers about French philosopher Michel Foucault's ideas about prisons and power and society. "I'm introducing him to many different texts that could really challenge how he thinks and sees the world," Amin said. "We try to give him as much work that gets him to be critical in hopes of finding out what really led him to do this," Amin added. "I think that's the first step, for him to really have an answer as to why he did what he did." In his testimony, Yusuf said the three defendants in the trial helped goad their friends into joining a complicated plan to go to Syria. This ISIS case has rocked Minneapolis. The courtroom gallery erupted last week during Yusuf's testimony after some young Somalis on the back benches told Yusuf's mother that her son was a spy. U.S. District Court Judge Michael J. Davis ended up throwing some people out of the courtroom to restore order. Yusuf was subjected to blistering cross-examination on Monday as defense attorneys claimed there were inconsistencies in his story. The prosecution plans to call two other young men who say they were involved in the alleged conspiracy. One of them backed out of the plan, told the FBI about the plot, and became a confidential informant. Defense attorneys say the FBI used him to entrap their clients and that has sparked protests outside the courthouse. "Somali youth are under attack," one chant begins. "Stand up, fight back." Because all the men involved in the case are all in their early 20s, there has been a push to develop a program that helps young men like Yusuf who have pleaded guilty to terrorism charges. Amin says watching this happen in Minneapolis is heartbreaking and brings back painful memories. The Twin Cities struggled with young men from the Somali community leaving to join al-Qaeda's arm in Somalia, al-Shabab, nearly 10 years ago. "You know, these are really young kids," Amin said, "and in my heart I really believe that they fell for something. They need a chance to correct, to undo, what they did." Judge Davis has appointed a German radicalization expert, Daniel Koehler, to assess the men who have already pleaded guilty in the case. Koehler runs the German Institute on Radicalization and de-Radicalization Studies. He wouldn't discuss the individual assessments he's made of the young men in Minneapolis, though he did tell NPR that he thought that some of the young men who pleaded guilty, though not all of them, could be helped with counseling. Koehler is in negotiations with six states, including Minnesota, to set up de-radicalization programs. "There's a real desire to figure something out to fix this," he said. Previous audio and Web versions of this story misidentified one of the men on trial as Adnan Farah. The defendant is Mohamed Farah.